I could not pen this story without first mentioning the integral part that two legendary Germans played in the creation of Korea’s hottest ever hatch. Ex-Audi senior designer Peter Schreyer, who arrived at the Hyundai-Kia group a decade ago, is now head of design for both brands. He and his team are responsible for not only this hatch but more poignantly, they've successfully elevated the brand's designs and aesthetics to levels comparable with some of Europe's top makes. Meanwhile, taking Hyundai’s performance and handling to a whole new level was Albert Biermann, the former BMW M Division chief engineer who is now holding Hyundai’s R&D reigns, which the brand calls its “N” high-performance department. 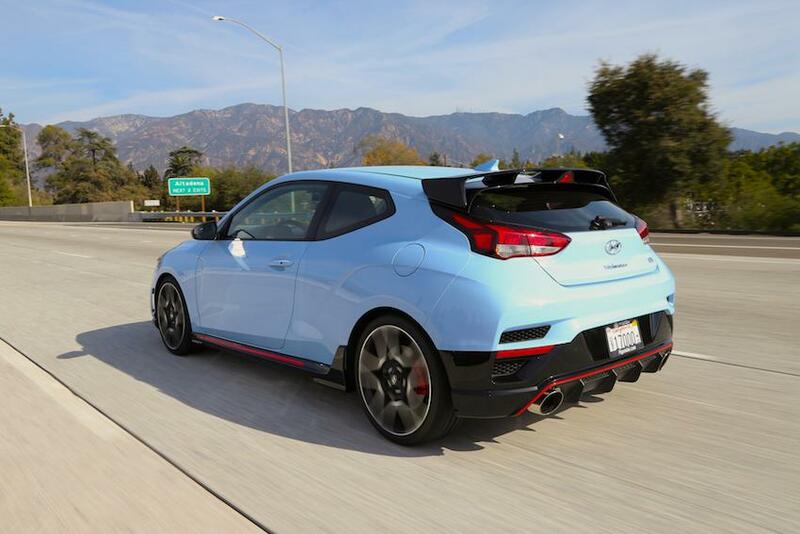 He particularly revelled with the settings on the Veloster N.
Incorporating a huge hungry-looking hexagonal grille, sharp upslanting headlights, big wheels, red brake calipers and a sporty rear roof wing, the hatch’s addictive sky blue and bright red accents around the front spoiler and side skirts put it very much in a league with the iconic VW Golf GTI. The funky 3-door layout (4-door is you include the hatchback) with a rear passenger door only built into the right-hand side of the car, give the Veloster N special presence on the road. Inside, this hot hatch gets a suitably sporty cockpit made out of inexpensive materials with nice touches like the leather wrapped gear-shifter and steering wheel, competent 8-inch BlueLink infotainment and sat-nav system, audio features and Android and Apple connectivity features, as well as supportive seats for those extended-right-boot-into-corner moments. But the undisputed highlight of the Veloster N is what sits under that hood. While the base Veloster N gets 250hp from its 2.0-liter turbocharged power unit, the tweaked N-spec performance version we tested is rated at 275hp peak power and 260lb-ft of torque. Even without flicking on the launch control, the Veloster N rockets off the line, jumping from zero to 60mph in under 6 seconds. Torque is particularly strong between 3000-6000 rpm and seems to enjoy hovering around the 3500 mark allowing the turbo to stay vocal with an addictive whistle. This car is plenty quick with a beefy exhaust under heavy acceleration and a curious but colorful cocktail of pops and crackles exuding from the exhaust when you lift off. As a sports car traditionalist, I particularly liked Hyundai’s brave decision to opt for one gearbox only—a 6-speed manual. As the revs climb quickly while the 19-inch Pirelli P-Zeros fight for grip, the limited slip diff on this front-drive hatch works hard to control understeer and torque steer. But as Biermann will say, ‘some torque steer was purposefully left in the mix to give the driver a feel for the power,” and that this addition was a calculated feature of the car. 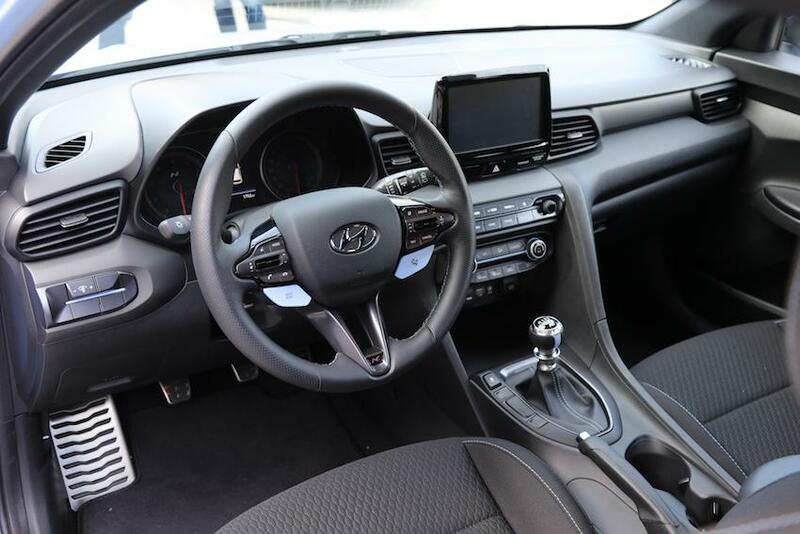 Yes, the Veloster N does have some torque steer under heavy acceleration, but it’s easy to control, and as he says, it does add to the overall sportiness of this rare hatch. Any hatch with such power would normally be fitted with high-performance, 4-pot Brembos. But in their wisdom, Hyundai decided to keep costs down and furnish the car’s needs in-house. The result is better than expected. Pedal rigidity is tight and braking performance is more than acceptable. In fact, the Veloster N’s stoppers are borrowed from the Optima, but given grippier pads, while special cooling ducts built into the N's functional aerodynamic sheetmetal, keep those rotors and pads from getting too warm and fading. This hatch feels light on its feet but nimble and stable in the corners with perfectly weighted steering. It transfers its weight superbly mid-corner and sounds great doing it. For just under $30,000, you’d have to look hard and long for a hot hatch with better cost performance.